Modes. Hams traditionally used CW. And then phone (AM, then SSB). And RTTY as well. But in recent years, new modes have been popping up like dandelions (or fire ant mounds). The plethora of new digital modes is nearly mind-boggling. But that variety of new modes is a subject for another month. This month, we’ll concentrate on just one of the “new” modes. We’ll look at the most popular one (by far), because it is what generates the most interest. It is called PSK31. “PSK” stands for “phase shift keying”. It is a very narrow audio signal – the “31” stands for 31 Hertz of bandwidth. It has exceptional weak-signal performance; the only other mode that comes close in that category is CW itself and JT65. Although there are at least 5 “flavors” of PSK signals (BPSK31, QPSK31, BPSK63, QPSK63, and BPSK125), I’m referring in this article to the one used most often (by far), which is BSPK31, or just PSK31 for short. I’m not going to focus on the theory of it, though, but will instead discuss the practical implementation in your shack. You’ll need an HF rig with USB capability, a computer with PSK31 software, and a sound card interface device. The interface is what sits between the rig and the computer’s sound card. There are ways to build your own interface, and there are many manufacturers of them, ranging from fairly inexpensive ($30 ) to super-deluxe models (>$300). Some of the major names are SignaLink, RigBlaster, Buxcom Rascal, Donner’s Digital Interface (I have one – very good, $40), MicroHam, and MixW RigExpert. The software is free and there are many options. I like Digipan (www.digipan.net), because it is simple to use and can decode not just 2 but up to 26 different signals at once. Cool! Ham Radio Deluxe with DM780 is very popular. Others are PSK31 Deluxe, W1SQLPSK, MultiPSK, MixW32, WinPSKse, and the list goes on and on. Yes, they’re free. Read the ratings and reviews. Download several and try them out. You’ll be happy to know that this is a low-power mode. Most guys run 15 to 50 watts, some of them much less. You shouldn’t ever need to run over 50 watts – your transmitter may not like semi-continuous duty of 50-100w xmit anyway. 25 to 30 watts is probably most common. Don’t even think about turning the amp on. Another important rule: turn your speech processor off. Modern rigs have great speech processors for SSB voice, but you do not want it for PSK31, because it will make your signal wide, annoying other hams. On the same note, make sure your mic gain is set conservatively. It is better to have it too low than too high. My experience is that a reasonable mic gain on voice SSB will probably be fine for PSK31. Finally, make sure your rig shows zero ALC. Having any significant amount of ALC will guarantee that your signal will splatter. Finally, use the common frequencies. You can deviate from this, but it is unlikely you’ll ever make a QSO unless you’re on or very close to this list (dial freq in MHz). Note your rig must be in USB mode! 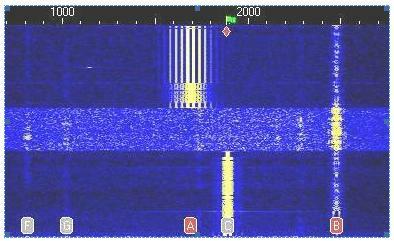 By far, most activity is on 20m, then 40m and 30m. There is some on 17m and 80m, but not nearly as much. Activity on the higher bands will probably increase as the number of dark blotches on Sol increase in the next few years. One way to make a bunch of quickie contacts, after you’re set up and working, is to jump in the PSK-related contests. The major ones are the TARA contests, which can be found at the TARA web site. They are fun and not overly competitive. Another place to find lots of PSK31 events and contests is to look at the PODXS070 calendar page. Lots of other good PSK31 info can be found at this ARRL page. A local ham runs www.bpsk31.com , which is also useful. This is way too short of an article to even come close to covering PSK31 well, but it is easy to find tons of info. Just Google “PSK31”. You can read for days. So read, but don’t stop there. Go do. It is fun! I’ve even heard from a reputable source that there may be some PSK31 during Field Day this year.